Although he has not been called a “great” general, to be compared with Napoleon, Lee or Grant, Washington nevertheless guided the American colonies to victory over the British through his persistence, personal sacrifices and tenacity. With the vital help of the French, Washington held the shaky revolutionary was together long enough for the British to tire of the exercise. Though he won only one major battle—Yorktown, again with help from the French—the revolution might well have failed had he not been in command. As president of the Constitutional Convention, Washington contributed very little in the way of specific recommendations, but as with the war, the enterprise was not necessarily destined to succeed; indeed, at several junctures the delegates were on the edge of giving up in frustration. But Washington's mere presence held them to their task through that long, hot summer until they produced the document that has guided the nation for over 200 years. As President of the Convention and therefore the first man to sign the Constitution, Washington's support was a silent but important factor in the ratification process, which also came perilously close to failure. As first President of the United States, Washington set the tone for the office, guiding the ship of state through some of the stormiest political waters in American history. Weary of public life, he wanted nothing more than to retire after one term to his beloved Mt. Vernon but was persuaded to remain for four more years, lest the country founder as it sought to create a new form of governance. 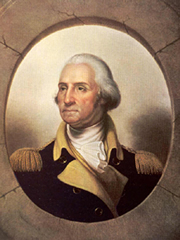 Taken individually, Washington's accomplishments in the service of his country would have earned him a permanent place of honor in American history. Taken together, they indeed support the idea that Washington was indispensable. Freeman, Douglas Southall. George Washington: A Biography. 7 vols. New York: Scribner's, 1948-1957.